Introduced in 1952 for the Nikon S Rangefinder, the500mm f/5 was Nikon's longest lens until the 1000/6.3 was introduced in 1960. 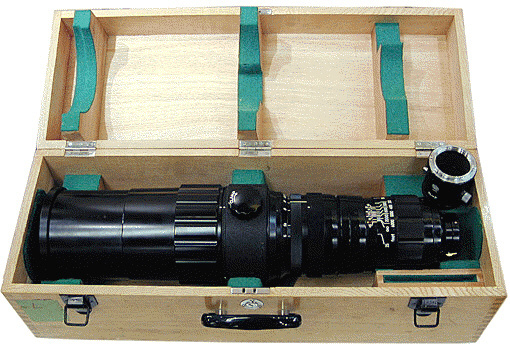 Even then, the500mm f/5 remained Nikon's longest non-mirror lens until the 600/5.6 of 1964. A hefty 19 pounds, it's one of Nikon's heaviest lenses. It's so large and heavy that most examples have more than their share of wear and scratches since it's difficult NOT to run into something with it. Robert Rotoloni estimates in his book "Nikon Rangefinder" that only about 300 were produced. This one is # 67109. It is one of the rarest Nikon lenses. In use the monumental500mm f/5 was slow and clumsy, with a pre-set diaphragm on the lens and a reflex housing mounted between the lens and the rangefinder body, converting it to a pseudo SLR. Note the extra large rotating tripod mount in the center of the lens, allowing the lens and camera to rotating as needed for horizontals or verticals. If you have not figured it out yet, the500mm f/5 was not a hand hold able and was used strictly with a very heavy duty tripod. After the advent of the F, the long rangefinder Nikkors were used sans reflex housing with the NF adapter so they could mount directly on the Nikon F. Such a NF adapter is shown below, on the far right of the box. Before today's glorious age of injection plastic and the lowest bidding subcontractor, Nikon delivered some lenses in hand crafted wooden crates, complete with lock and key. Photos courtesy and copyright of Hans Pahlen.